Lunar Reconnaissance Orbiter Camera images of each Apollo site taken at roughly the same orientation but with different sun angles to show the travel of shadows. Combined with knowledge of the Apollo site maps which show where the flag was erected relative to the Lander, long shadows cast by the flags at three sites - Apollo 12, Apollo 16, and Apollo 17 - show that the these flags are still “flying”, held aloft by the poles. There is no indication of a flag shadow in this Apollo 11 image. 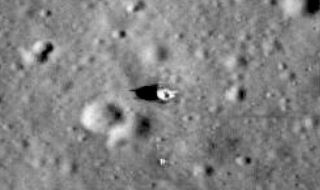 "From the LROC images it is now certain that the American flags are still standing and casting shadows at all of the sites, except Apollo 11," LROC principal investigator Mark Robinson wrote in a blog post today (July 27). "Astronaut Buzz Aldrin reported that the flag was blown over by the exhaust from the ascent engine during liftoff of Apollo 11, and it looks like he was correct!"